Over the past seven years I have been fortunate to travel to more than 50 cities in 30 countries to share my employer branding knowledge and experience with thousands of leaders. The No. 1 issue that continues to draw discussion and debate is whether employer branding should be a human resources or marketing function — or both! There are also a number of leaders which support the view it requires a combination of expertise from multiple functions to effectively deliver an employer brand strategy that builds value. 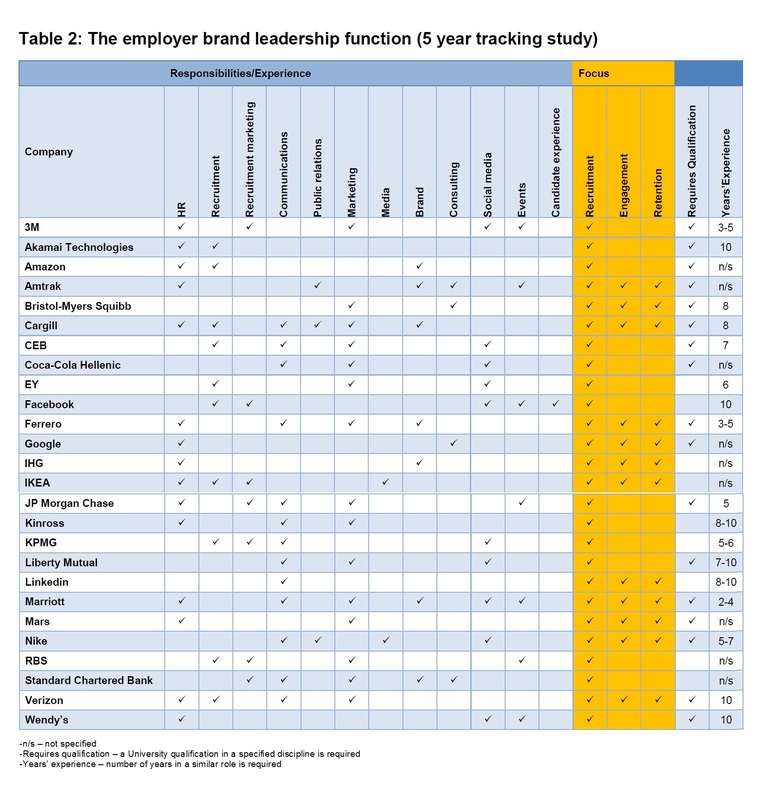 Our global research at Employer Brand International over the past five years shows a declining role of HR in employer branding, with 46 percent of HR departments responsible for the strategy in 2009 compared to 36 percent in 2014 (see the graphic). The study also found the traditional custodians of the corporate and consumer brands, the marketing department, is responsible for managing the employer brand in only 15 percent of companies. The survey findings also show clear evidence that the leadership of employer brands is evolving into other functions. Interestingly, the executive team (11 percent) up from 2 percent in 2009 and CEOs (10 percent) up from 1 percent in 2009 are now responsible for the employer brand strategy. This suggests more companies now deploying a strategic approach to employer branding. In 34 percent of companies, teams of two or more departments from human resources, marketing, and communications are responsible for managing the employer brand, compared to 31 percent in 2011. Nike and Facebook recently placed ads to recruit employer brand leaders. However, this trend is not limited to Fortune 500 companies. According to indeed.com, during the period 2009-2013 there was more than a 300 percent increase in the number of employer brand manager positions advertised in the U.S.
Over the past five years I have been tracking, collating, and analyzing job descriptions for employer brand leader positions as vacancies have been advertised around the world. The review found a diversity of approaches being taken by companies in recruiting employer brand leadership talent (see the graphic below). What is consistent is the increasingly strategic nature of the role requiring professionals with experience in functions such as branding, consulting, social media, and events. The focus for the employer brand leader is on recruitment at companies such as Facebook, Amazon, and KPMG. However companies such as LinkedIn, IKEA, and Amtrak have adopted a holistic approach to employer branding across the total employment lifecycle. History shows that companies transition towards a strategic approach to employer brand management after two to three years of adopting the concept. This is consistent with how employer branding evolves inside a company as expertise and experience builds across the leadership teams. It is clear that with the increasing talent shortages around the world we will begin to see many more follow the lead of companies such as Google, IBM, Marriott, 3M, and EY in recruiting leaders and take advantage of the value an employer brand strategy has on profitability and sustainability. While there are company culture and structural issues in reorganizing and implementing a holistic employer branding function, if the trend of appointing employer brand managers continues as it is has in the U.S., Europe, and the UK there is no doubt the role of the employer brand leader will become more commonplace in places such as Russia, Brazil, UAE, Eastern Europe, and Asia as companies in these regions seek the benefits gained by those who are already three to five years into their journey. Too many companies view employer branding as a “project-based” or “add-on” function to an already overstretched human resource function and then complain about the lack of return on investment. We are still at a phase of first-mover advantage with our research finding only 17 percent of companies having a clearly defined strategy (up from 14 percent in 2011). Those acting now still have time to ensure they will become top of mind as people choose employment in possibly the most challenging economic times in history. When considering the evolving nature of business impacted by political, economic, social, and technological changes (and increasingly environmental — think BP!) and the role of the employee in contributing to brand equity, the focus of future discussions should be on the skills, experiences, and capabilities required to successfully execute the employer brand strategy and the structure of the team that supports it. Whether the personnel come from human resources, marketing, communications, or other function is not the debate we should be having. The focus should be on how your company develops a competent team of professionals sourced from inside and outside the firm who can develop and execute an employer brand strategy that builds value. The traditional siloed approach to managing the attraction, engagement, and retention of talent is out of date and out of step with today’s candidate and employee needs. More needs to be done by organizations to facilitate cross-functional leadership of the employer branding function to ensure a more cohesive approach. In more than 100 events I have presented at I can only recall one finance director in the audience (from Nike!). There is little wonder why one of the biggest challenges for employer branding leaders is to gain budget approval for their employer brand strategy. Managing the employee experience across the employment lifecycle should be a shared responsibility. Employer brand leaders need to build awareness and capability in employer branding across the organisation rather than relying on only one or two leaders to manage the function as has been traditional practice.